This is “Steps in Developing a Research Proposal”, section 11.2 from the book Successful Writing (v. 1.0). For details on it (including licensing), click here. Writers understand the importance of choosing a topic that fulfills the assignment requirements and fits the assignment’s purpose and audience. (For more information about purpose and audience, see Chapter 6 "Writing Paragraphs: Separating Ideas and Shaping Content".) Choosing a topic that interests you is also crucial. 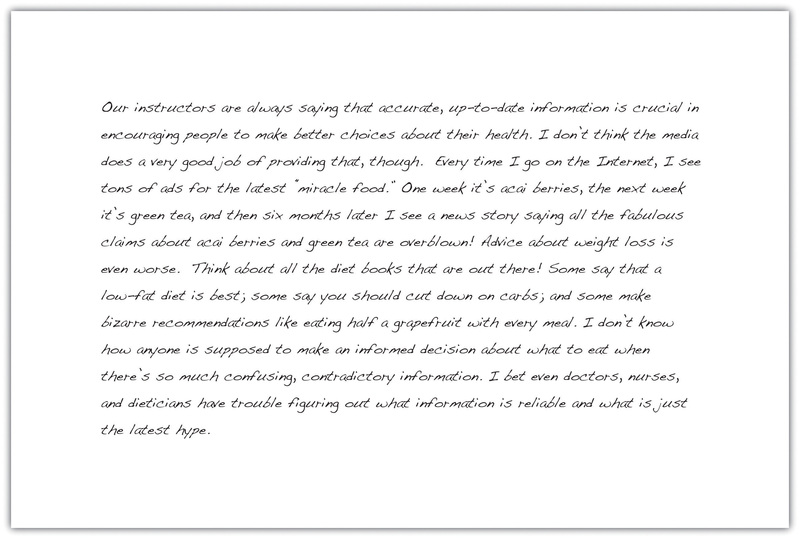 You instructor may provide a list of suggested topics or ask that you develop a topic on your own. In either case, try to identify topics that genuinely interest you. A good research paper provides focused, in-depth information and analysis. If your topic is too broad, you will find it difficult to do more than skim the surface when you research it and write about it. Narrowing your focusThe process of identifying a specific angle from which to approach a broad topic in order to limit it and make it more manageable. is essential to making your topic manageable. To narrow your focus, explore your topic in writing, conduct preliminary research, and discuss both the topic and the research with others. “How am I supposed to narrow my topic when I haven’t even begun researching yet?” In fact, you may already know more than you realize. Review your list and identify your top two or three topics. Set aside some time to explore each one through freewriting. (For more information about freewriting, see Chapter 8 "The Writing Process: How Do I Begin?".) Simply taking the time to focus on your topic may yield fresh angles. Another way writers may focus a topic is to conduct preliminary researchResearch conducted early in the writing process for the purpose of exploring a topic and narrowing the focus.. Like freewriting, exploratory reading can help you identify interesting angles. Surfing the web and browsing through newspaper and magazine articles are good ways to start. Find out what people are saying about your topic on blogs and online discussion groups. Discussing your topic with others can also inspire you. Talk about your ideas with your classmates, your friends, or your instructor. Review the list of topics you created in Note 11.18 "Exercise 1" and identify two or three topics you would like to explore further. For each of these topics, spend five to ten minutes writing about the topic without stopping. Then review your writing to identify possible areas of focus. 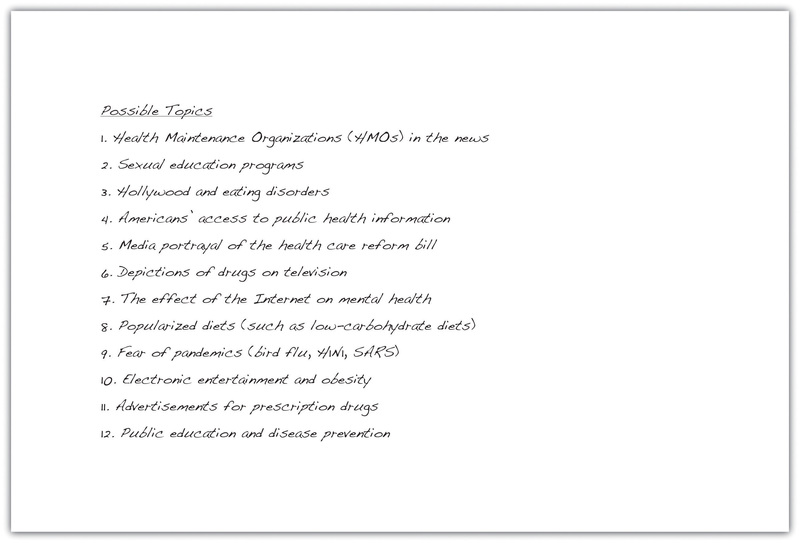 Your freewriting and preliminary research have helped you choose a focused, manageable topic for your research paper. To work with your topic successfully, you will need to determine what exactly you want to learn about it—and later, what you want to say about it. Before you begin conducting in-depth research, you will further define your focus by developing a research questionA broad, open-ended question that a writer uses to guide the research process. In the research paper, the writer attempts to answer the question thoughtfully., a working thesis, and a research proposal. To determine your research question, review the freewriting you completed earlier. Skim through books, articles, and websites and list the questions you have. 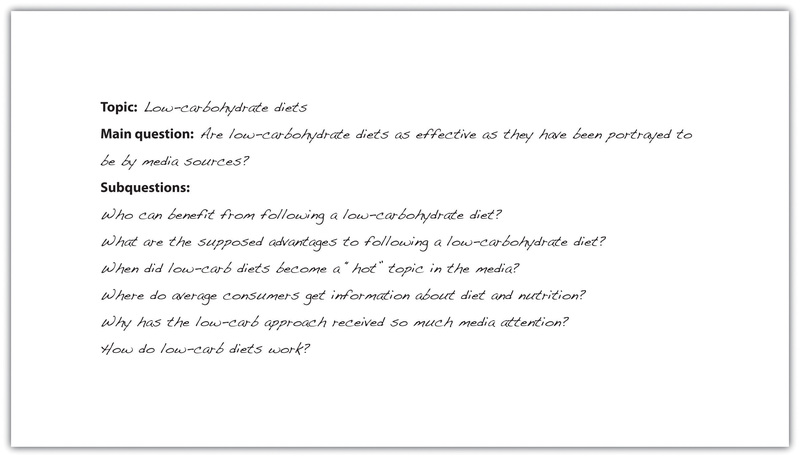 (You may wish to use the 5WH strategy to help you formulate questions. See Chapter 8 "The Writing Process: How Do I Begin?" for more information about 5WH questions.) Include simple, factual questions and more complex questions that would require analysis and interpretation. Determine your main question—the primary focus of your paper—and several subquestions that you will need to research to answer your main question. Using the topic you selected in Note 11.24 "Exercise 2", write your main research question and at least four to five subquestions. Check that your main research question is appropriately complex for your assignment. A working thesis concisely states a writer’s initial answer to the main research question. It does not merely state a fact or present a subjective opinion. Instead, it expresses a debatable idea or claim that you hope to prove through additional research. Your working thesis is called a working thesisThe first, preliminary thesis statement that a writer uses while outlining an essay. A working thesis statement may change during the writing process. for a reason—it is subject to change. As you learn more about your topic, you may change your thinking in light of your research findings. Let your working thesis serve as a guide to your research, but do not be afraid to modify it based on what you learn. Write a working thesis statement that presents your preliminary answer to the research question you wrote in Note 11.27 "Exercise 3". Check that your working thesis statement presents an idea or claim that could be supported or refuted by evidence from research. 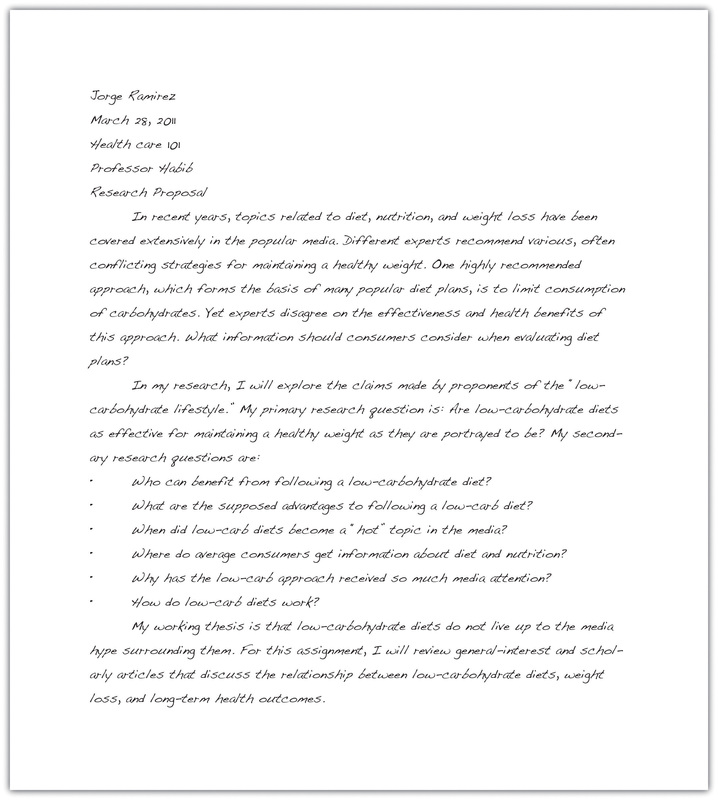 A research proposalA brief document that includes a writer’s main research question, related subquestions, working thesis, and plan for gathering information. is a brief document—no more than one typed page—that summarizes the preliminary work you have completed. Your purpose in writing it is to formalize your plan for research and present it to your instructor for feedback. In your research proposal, you will present your main research question, related subquestions, and working thesis. You will also briefly discuss the value of researching this topic and indicate how you plan to gather information.